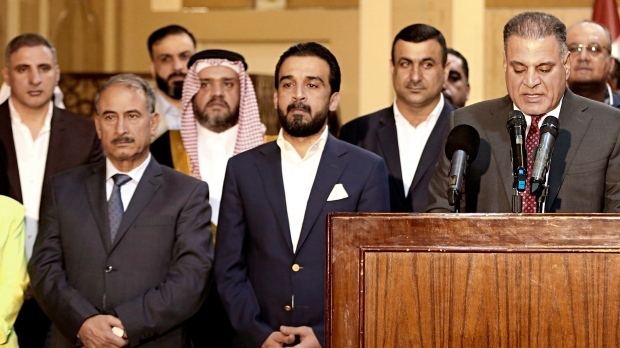 BAGHDAD -- Amid escalating political wrangling, Iraqi lawmakers elected an Iran-backed Sunni Arab as speaker of parliament on Saturday, the first step in forming a new government four months after national elections. The 37-year old speaker was supported by the pro-Iran bloc inside parliament, the Building coalition, which is mainly made up of Iran-backed Shiite militiamen -- underscoring the growing Iranian influence in the process of forming the country's new government. During a secret ballot, 169 lawmakers voted for Mohammed al-Halbousi, the former governor of Anbar, and 89 others voted for the former defence minister, Khalid al-Obeidi, lawmaker Ahmed al-Asadi said.